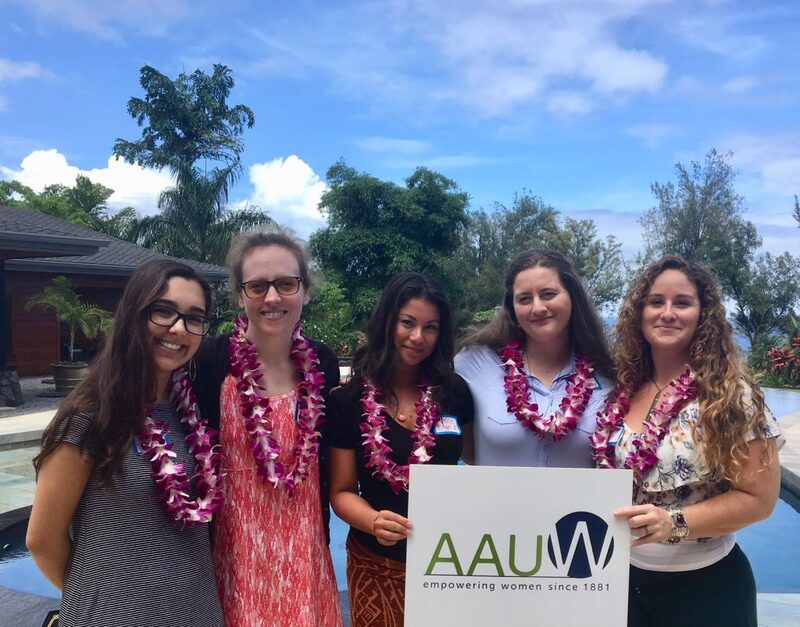 Proud to announce our AAUW Hilo Branch Scholarship Winners for 2018. Left to right: Kaylee DeCambra; Kathryn Strong; Kaimalie Zirker; Amanda Alvarado; Liesl Nayeli. Kathryn Strong has spent 13 years working in the environmental health field. Kathryn studied nursing in college. She then served as a Peace Corps Volunteer for three years in Cambodia, working to improve health care education at a village health clinic. Her current goal is to gain a Master’s Degree in the UHH Tropical Conservation Biology and Environmental Science (TCBES) program. Amanda Alvarado is seeking to complete a Master’s Degree in Counseling Psychology at UHH. Her research interests include PTSD, Trauma, Adolescent Mental Health, Sexual Trauma and forensic interviewing. After obtaining her degree Amanda hopes to apply for grants and funding to open a facility for local youth who need extra attention, motivation and positive role models. Kaylee DeCambra is double majoring in Sociology and Gender and Women’s Studies, as well as pursuing certificates in Educational Studies and Spanish. After graduating with her Bachelor’s Degrees, she plans on entering the Counseling Psychology program at UHH. Growing up in Hawaii, Kaylee sees this as a great opportunity to work with the Hawaii community and advocate for better support of the people here. Liesl Nayeli is working to complete a Bachelor’s Degree in Psychology from UHH. She is doing a practicum in psychology with a program called Self Discovery Through Art. This program works with adults with chronic mental illness using cognitive behavioral therapy and art as medicine. Kaimalie Zirker is a mother of a second grade son and is pursuing a Bachelor of Science Degree in Nursing at UHH. Kaimalie hopes to combine her love of flying with her love for saving lives, by working with air ambulance services. click on these PDF files!